Tomorrow is my sweet parents 47th wedding anniversary. I should've made this card several days ago when they were still here in the Bay Area so the card wouldn't be late (my biggest pet peeve). I guess I was having too much fun when they were here to work in my little studio. 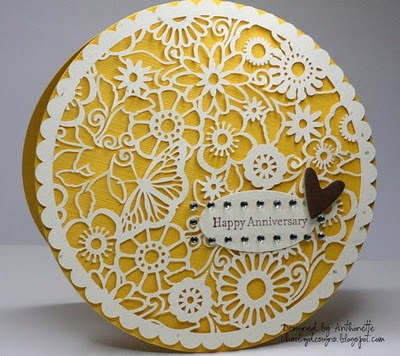 Tonight I decided to take on Cath's Moxie Fab World Challenge: Diggin' on Doilies and Lace. 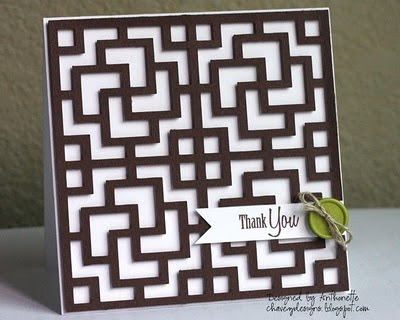 This card, my friends, shows what the Silhouette machine can do! Yowser! This butterfly lace circle was cut with my Silhouette. It's by far the most complicated cut I've had my machine do. I was going to put the numbers 47 on the card, but I didn't want to cover up the beautiful lace. I also propped up the entire lace layer on foam tape so it's not flat on the card front. I only wish I had used a plain cream cardstock instead of a confetti paper, because the "confetti" looks like stray ink marks. Oh well! Well, have a good one. Thanks for stopping by! Hello everyone! I haven't created anything new in several weeks. We've been busy with visits from a good friend, in-laws, and my family. My family left yesterday back to New Mexico. We had a great visit. We spent Friday in San Francisco. The weather was perfect! 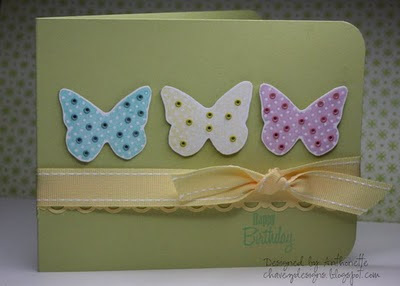 I created this card last night for a birthday party today for one of Kalino's good friends and classmates. I used my Silhouette to cut the soccer ball and patch of grass. 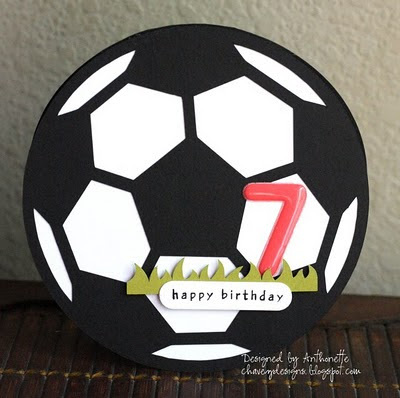 I created a similar card a few weeks ago, but it didn't have the grass or number, plus I was rushed and didn't have time to photograph the card. Hope you're having a good weekend. We spent the day with family. My in-laws and niece are here from Southern CA for the weekend. My parents, sister, and niece are arriving in 3 days from New Mexico. So exciting! I wish I would've have made the Lemon Tart decorative border wider so you can actually see it. It's very hidden behind the ribbon. 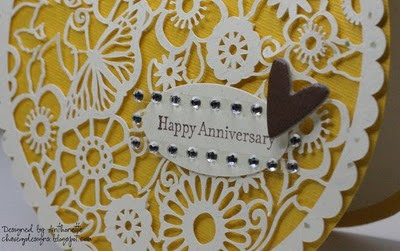 I almost forgot that today is my 2-year blogging anniversary for Chavez Designs! I've actually been blogging for over 5 years on my son's blog. I started Chavez Designs to post a card in Kristina's first ever color inspiration challenge, so I owe it to her for getting me started on this blog. What made you start your blog? It's been so fun meeting several of you along the way. I'm sure I'll get a chance to meet many more of you. 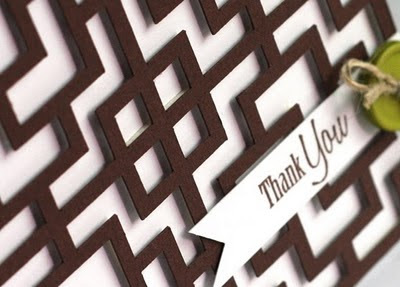 Thank You - Love Welded Words! I love Saturdays! We're off to IHOP for some yummy pancakes with our good friend that is here from Austin. I hope your Saturday is good too. I made this card just for fun. 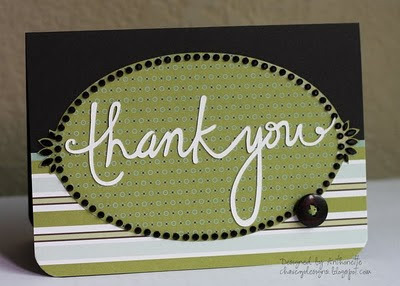 The "thank you" was cut with my Silhouette; I love welded words! There was no stamping or ink used on this card. The black gems were a great deal at the CHA Super Show. The final card size is 6"x4". I threaded the button with cardstock. I intended to submit this card for the last Everything But the Kitchen Sink Challenge, which was a sketch challenge based on Kelly Marie's headboard. I thought this design for the Silhouette looked a lot like her headboard. This card is a 4.25" square. The chocolate chip design is elevated on foam tape. The card is very basic. A sentiment and a button finish it off. Life's been busier than usual. My son had a nasty intestinal virus for almost a week. I was "home schooling" for 3 days; not easy. Helping at school was also crazy busy. We were getting ready for a visit from a team that could recommend us for a California Distinguished School Award. We got their recommendation, so yay! As always, thanks for the lovely comments and have a good one!